Designed by Short Brothers as a torpedo carrying seaplane, Short 184s were the first aircraft to be built at Yeovil with a contract to build 12 aircraft. 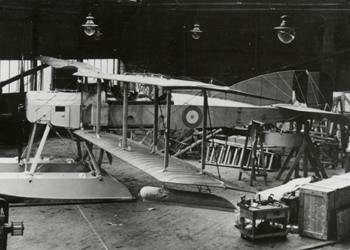 Completed aircraft were delivered by rail to Hamble on the Solent for final assembly and test. A Westland built Short 184 served with the fleet at Jutland, the remains of this aircraft are on view in the Fleet Air Arm Museum at Yeovilton, Somerset.